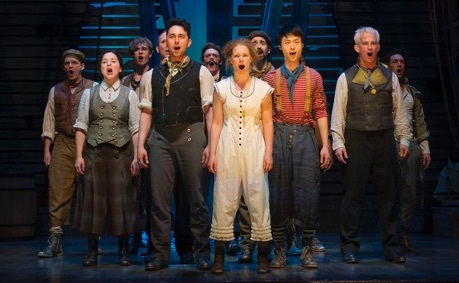 Peter and the Starcatcher, now playing at the Shaw Festival, is based on the children’s novel Peter and the Starcatchers [sic] (2004) by Dave Barry and Ridley Pearson, a prequel to J.M. Barrie’s classic play Peter Pan (1904). 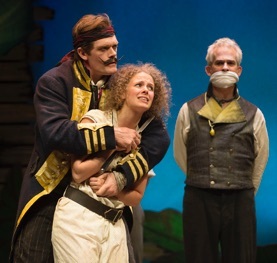 The play Peter and the Starcatcher by Rick Elice suffers the fate of most modern prequels to older classic works in that it is completely unnecessary. Any great work, like Barrie’s Peter Pan, is complete in itself and the author has told us all he feels we need to know about the characters involved. Do we really need to know how Peter came to fly or not to age? We don’t. Indeed, not knowing the explanation for things like these are what helped to make Peter Pan such a mythic character in the first place By dutifully providing his own background to all the magical givens in Barrie’s play, Elice’s play merely drags Barrie’s characters down to Elice’s own prosaic and satirical level. The play’s primary concern is the fate of two identical-looking trunks. One of them contains a priceless treasure that Lord Aster (Patrick Galligan) has been appointed to guard until it reaches its destination, the kingdom of Rundoon. The other trunk is a decoy filled with sand meant to be carried by the aged ship, The Neverland, piloted by the wicked Bill Slank (Graeme Somerville) also headed for Rundoon. Slank manages to arrange for the trunks to be switched so that The Neverland now carried the precious cargo. Besides this, since Lord Aster feels his mission is dangerous, he entrusts his daughter Molly (Kate Besworth) and her nanny Mrs. Bumbrake (Jenny L. Wright) to travel with Slank. Slank is also carrying three orphaned boys Prentiss (James Daly), Ted (Andrew Broderick) and one with no name (Charlie Gallant), who is simply called Boy but eventually is renamed Peter Pan. When Alf (Shawn Wright), a old seafarer, goes to feed the pigs, Molly accompanies him and discovers where the orphans are hidden. She frees them from their confinement and reveals that she is an apprentice starcatcher, one of a handful of people employed by the Queen to collect “starstuff”, the magical dust that falls from stars to earth, in order to destroy it. At this point, if not before, major rifts in the plausibility of the narrative have started to appear. If Lord Aster’s mission is so dangerous, why doesn’t he leave Molly and her nanny in England? Lord Aster and Molly both carry amulets filled with starstuff that allows them to communicate across vast distances. Starstuff can even make animals and people fly. If starstuff is thus so useful, what is the point of collecting it to destroy it? Supposedly, the British don’t want starstuff to fall into the wrong hands. But it isn’t in the wrong hands now. Why not use it to make Britain even more powerful? who has which truck and how everyone happens to turn up at different locations on the tropical island of the Mollusks. Even though I saw the play previously in New York, I found it just as confusing this time as I did before. It doesn’t help that the story makes no sense. It’s no use saying it’s just a fantasy since even fantasies have to be internally consistent. But beyond that Jackie Maxwell’s direction aids in the confusion. She has stage right represent The Wasp, but she uses stage left, extreme stage left beyond the proscenium and extreme stage right to represent The Neverland. Act 2 opens with a very funny chorus of men and women dressed as mermaids, but why they are mermaids is not explained until Scene 9 in that act. Elice has shown us that starstuff can help people communicate over distances and can make people levitate. He has not shown, prior to the mermaid chorus, that it can also transform creatures into other creatures. That’s why the scene seems to come out of nowhere. Only in Scene 9 do we learn that starstuff transforms beings into what they want to be. We thus have to assume that fish, for unknown reasons, really want to be mermaids. For all its frenetic action, after two hours we discover that what is responsible for Peter’s eternal youth and his ability to fly is starstuff, or in other words, magic. Did anyone who saw Barrie’s Peter Pan in 1904 assume it was anything else? Do we need Elice’s play to explain this? Besides this, despite all the events of the action, Elice still requires a long static speech at the end of the play to link what we’ve just seen to Barrie’s play, a fact that would seem to point to the play’s ineffectiveness even as a prequel. If the main pleasure of the show is not the story, it is also not the dialogue where the prime source of humour is a mixture of really bad puns, anachronisms and self-referentiality as in “See, we’re at the Shaw Festival!” Instead, the main pleasure comes from seeing the Shaw ensemble adopt the mode of physical theatre in telling the story. The entire cast narrates the action – sometimes as individuals, sometimes as a group. Actors play numerous characters and sometimes even scenery as when a group line up to form a corridor on The Neverland. Molly opens a door (a person stepping aside) and we see various rooms – one with people gambling, one with people praying and one with sailors torturing one of their own. Actors form the four corners of a boxing ring or flutter cloth to make waves in the sea or hold fronds to become a jungle. With its cartoonish characters the show is an open invitation for actors to go over the top. This is exactly what happened when the show transferred from Broadway to New World Stages when I saw it in 2013. Fortunately, at the Shaw most of the actors avoid this temptation most of the time. Charlie Gallant is an excellent choice for Peter. He is able to radiate innocence and grow out of his childish funk to convey childlike wonder. This show also gives him the chance to show that he is a fine physical performer through his many athletic tumbles and the energy that animates all his movements. As Black Stache, Martin Happer proves, if he hasn’t before, that he has a gift for physical and verbal comedy and a redoubtable sense of timing. This role was the most overdone in New York, but here Happer keeps the character within the bounds of a panto-like villain and is all the funnier for it. In fact, after seeing Happer as this faux-Captain Hook, you can easily imagine how well he would do as the real thing in Barrie’s play. The character of Molly is very much a version of a self-confident know-it-all girl like J.K. Rowling’s Hermione Granger, but Kate Besworth lends her enough concern for others and personal vulnerability that we care for her success as much as Peter’s. The other roles are all well taken. Patrick Galligan’s Lord Aster is no more than a caricature of British jingoism, but at least Galligan makes Aster’s unquestioning patriotism funny. Cast for a change in a non-song-and-dance role, Kelly Wong as Captain Scott shows what a resonant and authoritative speaking voice he has, suitable for a wider range of parts than he has so far been given at the Festival. Among the bad guys, Graeme Somerville obviously enjoys the chance to play an outright villain and snarls out his lines and and moves with a swagger in extreme contrast to the calm thoughtfulness of his previous roles at the Festival. Jonathan Tan gets his biggest role so far as Black Stache’s right-hand man Smee. He speaks with evil enthusiasm but does let himself get carried away when Smee throws a fit of anger so huge it would be more believable in an animated movie than on stage. Billy Lake plays several roles, but while he is more self-contained as Grempkin, the orphan-seller, he goes way over the top as Fighting Prawn, the British-Italian ruler of the Mollusks who speaks almost entirely in terms of Italian cuisine. Jenny L. Wright is a delight in two roles. In one, the nanny Mrs. Bumbrake, she embodies the stereotype of the proper British matron who in a panto would likely be played by a pantomime dame. Despite Bumbrake’s propriety Wright wrings out all the humour from the nanny’s rather swift fall into a relationship with the the old sea-salt Alf. Shawn Wright, for his part, plays this stereotype with equal vigour. Jenny L. Wright’s other role is as the mermaid Teacher, which requires her to show off her previously unknown ability at aerial silks. As Peter’s fellow orphans, Andrew Broderick is more able to keep his comedy more pointed and controlled than James Daly, who is rather too given to shouting. In her notes on the Shaw Festival website, director Jackie Maxwell remarks, “This piece requires a type of theatrical storytelling that we rarely get the opportunity to practice here at The Shaw”. The truth is that Maxwell could have indulged in this type of narrative theatre much earlier in her tenure if she had wanted to. The plays of Bertolt Brecht require exactly the same mode of non-naturalistic presentation with songs and group narration, they lie directly within the original Shaw Festival mandate and they are of much more historical, theatrical and intellectual importance than this frippery from Elice. In its history the Festival has staged only two of Brecht’s non-musical plays and neither of these were among his great pieces of epic theatre like Mother Courage (1941), The Good Woman of Setzuan (1943) or The Caucasian Chalk Circle (1948) that demand a highly imaginative, highly theatrical mode of direction. If the Festival could ever manage to overcome its Brechtophobia, we could see how Shaw’s greatest 20th-century contemporary threw realistic stage conventions out the window to tell stories of substance. With Starcatcher, all we get is a large dose of theatricality in the service of silliness. There can be a kind of sublime silliness as in the topsy-turvydom of Gilbert and Sullivan (another Shaw Festival phobia), in Monty Python or in traditional British pantos. But Rick Elice’s Starcatcher, like many modern prequels, is a literary parasite that derives what little substance it has not from what it creates but from the imagination of its pre-existing host. It’s good to see the Shaw actors engage in a different style of acting. It would be even better to see them act in that style in classic plays that are worthy of their effort. 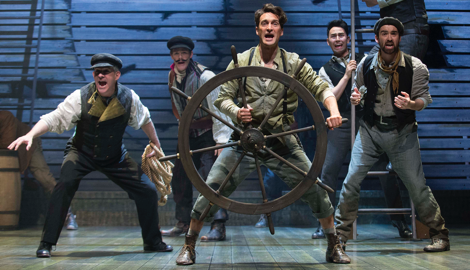 Photos: (from top) Cast of Peter and the Starcatcher, Charlie Gallant (centre) at wheel; Martin Happer as Black Stache, Kate Besworth as Molly and Patrick Galligan as Lord Aster; Cast of Peter and the Starcatcher. ©2015 David Cooper.